Taoiseach Leo Varadkar has said that Theresa May's decision to seek changes to the Brexit deal "only reinforces" the need for a backstop. As Anglo-Irish relations hit a modern-day low yesterday, European leaders also rounded on the embattled Prime Minister over what they see as an act of bad faith. In a co-ordinated effort, they publicly admonished UK politicians over what is being seen as Mrs May's "backstab on the backstop". EU Commission President Jean-Claude Juncker said those politicians in Westminster hoping that Europe planned to "abandon the backstop and so Ireland at the last minute" would find themselves disappointed. "This is not a game and neither is it a simple bilateral issue," Mr Juncker added. "Ireland's border is Europe's border - and it is our union's priority." In a terse phone call between Mr Varadkar and Mrs May, the Taoiseach said Ireland's position remained "unchanged". He also stressed that "the latest developments had only reinforced the need for a backstop which is legally robust and workable in practice". The news came as Mrs May conceded that the Government had not settled on a way to replace the backstop. The Prime Minister told MPs "there are a number of proposals" for doing so. 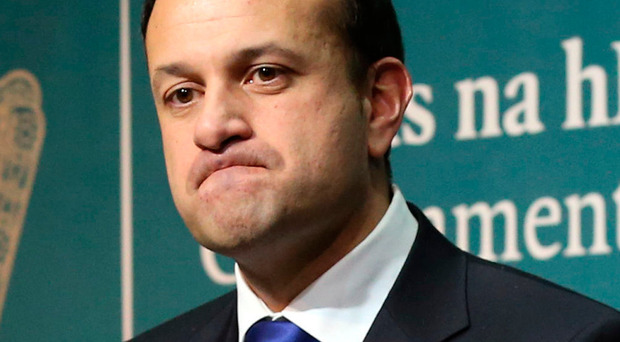 Meanwhile, Mr Varadkar told a private Fine Gael meeting last night his government would support a delay to Brexit beyond March 29 if Mrs May sought one. Despite efforts on both sides, relations between the UK and Ireland have continued to sour throughout the Brexit process. In an unscripted remark at an event in Dublin yesterday, Tanaiste Simon Coveney took aim squarely at the Conservative Party and suggested that internal wrangling was the reason behind Mrs May's U-turn on the backstop. "If this is about keeping a party together that for 30 years has been torn about by different perspectives on the relationship with the European Union... if that's what this is about, I cannot allow that agenda to make Ireland the casualty," Mr Coveney said.